Thin provisioning is a method of optimizing the efficiency with which the available space is utilized in SAN networks. In computing, thin provisioning involves using virtualization technology to give the appearance of having more physical resources than are actually available. Thin provisioning (QThin) operates by allocating disk storage space in a flexible manner among multiple users, based on the minimum space required by each user at any given time. 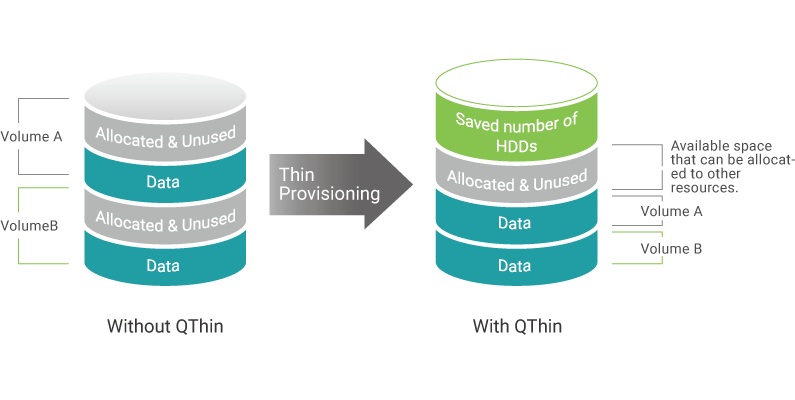 QThin uses our advanced storage pool architecture to achieve this functionality. The capacity of the storage pool is shared by all volumes inside the pool. This means that the XCubeSAN is able to support more host servers with a fewer number of hard drives, thereby reducing initial acquisition cost. As the storage pool fills, you can add extra disk groups to expand the storage pool capacity without downtime. Normally when data is deleted from the host or server, the unused storage blocks cannot be released back to the overall storage pool. QThin uses zero reclamation technology to recycle unused storage blocks to provide greater efficiency and a higher utilization rate. When enabled, the space reclamation process will run in the background automatically with the lowest system priority without affecting system performance. You can set as many as six policies for each storage pool to define what to do when the predefined storage utilization threshold hits the limits. Starting with 60% utilization, the administrator can choose the level of warning and what action they would like to take, such as deleting snapshots, space reclamation, and de-activating the storage pool, allowing more flexibility and simpler administration. With QThin technology, companies don’t need to buy a large number of disks to manage data growth confidently. Start with the minimal number of disks, and then bring additional drives online as capacity demand grows. QThin can release a volume’s previously provisioned but unused capacity, helping to avoid a poor resource utilization rate and, in fact, drive utilization towards 100% with very little effort from system administrators. Available disk space can be made available to other hosts and servers. 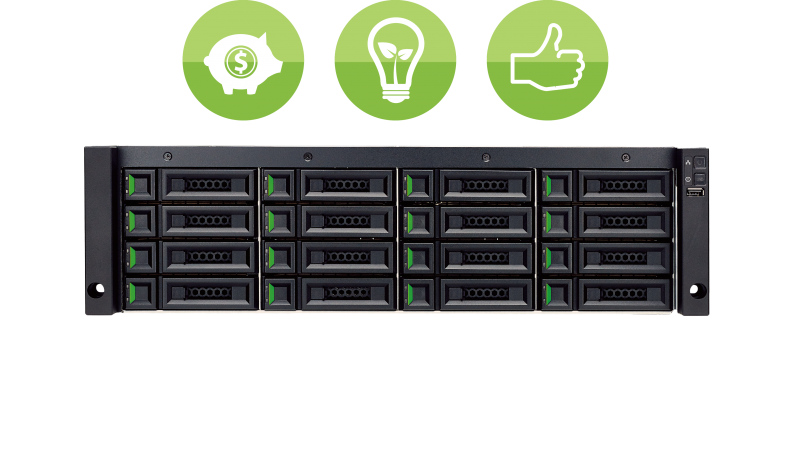 The XCubeSAN system can serve more hosts and servers to achieve a higher consolidation ratio. Therefore, QThin can significantly help reduce your total cost of ownership. When QThin is enabled, the capacity of the storage pool can be expanded online by adding more disk groups with zero downtime. A thin storage pool can have up to 32 disk groups with each disk group containing up to 8 disk drives. 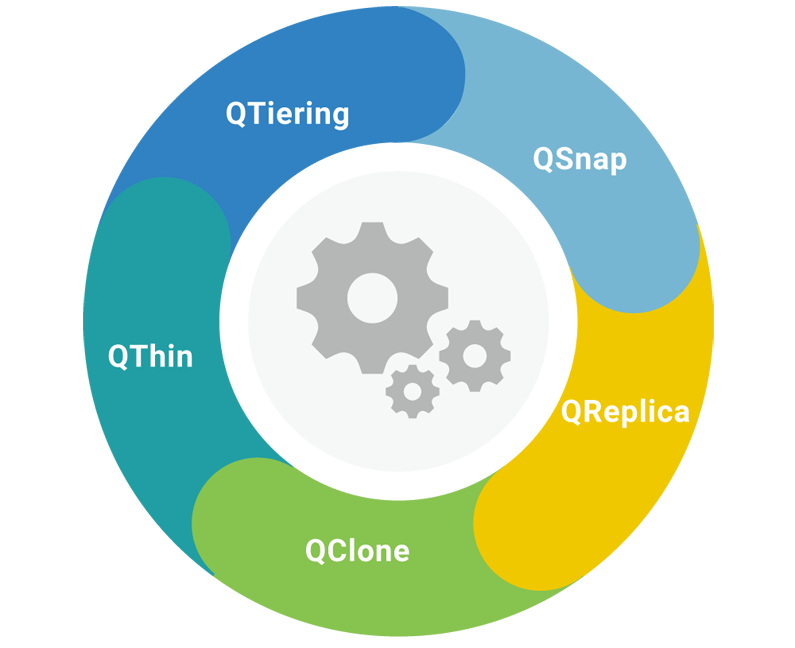 QThin can also seamlessly integrate and interact with other QSAN storage features such as snapshot, local clone, remote replication, SSD cache, and auto tiering.